There is great concern regarding the development of noise-induced hearing loss (NIHL) in youth caused by high sound levels during various leisure activities. Health-orientated behavior of young adults might be linked to the beliefs and attitudes toward noise, hearing loss, and hearing protector devices (HPDs). The objective of the current study was to evaluate the effects of attitudes and beliefs toward noise, hearing loss, and HPDs on young adults' hearing status. A questionnaire and an audiological test battery were completed by 163 subjects (aged 18-30 years). The questionnaire contained the Youth Attitude to Noise Scale (YANS) and Beliefs about Hearing Protection and Hearing Loss (BAHPHL). A more positive attitude or belief represented an attitude where noise or hearing loss is seen as unproblematic and attitudes and beliefs regarding HPDs is worse. Hearing was evaluated using (high frequency) pure tone audiometry (PTA), transient evoked and distortion product otoacoustic emissions. 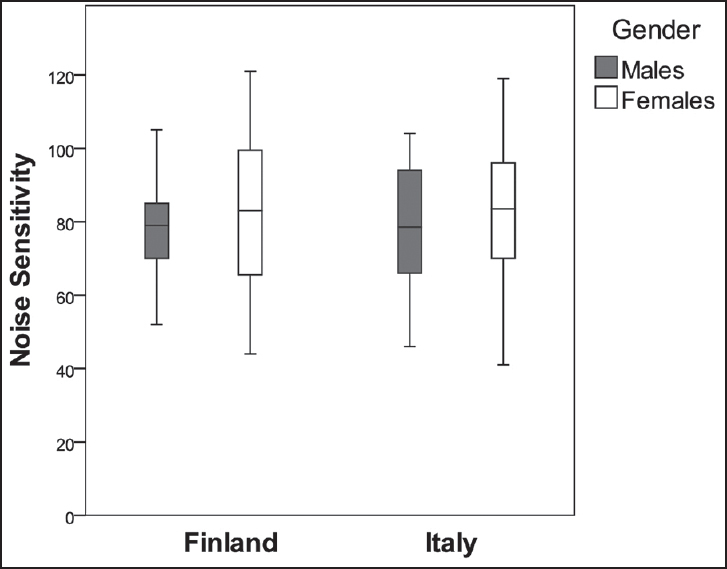 First, mean differences in hearing between the groups with different attitudes and beliefs were evaluated using one-way analysis of variance (ANOVA). Second, a χ2 test was used to examine the usage of HPDs by the different groups with different attitudes and beliefs. Young adults with a positive attitude had significantly more deteriorated hearing and used HPDs less than the other subjects. Hearing conservation programs (HCPs) for young adults should provide information and knowledge regarding noise, hearing loss, and HPDs. Barriers wearing HPDs should especially be discussed. Further, those campaigns should focus on self-experienced hearing related symptoms that might serve as triggers for attitudinal and behavioral changes. Great concern arises from recreational noise exposure, which might lead to noise-induced hearing loss in young adults. The objective of the current study was to evaluate the effects of recreational noise exposure on hearing function in young adults. A questionnaire concerning recreational noise exposures and an audiological test battery were completed by 163 subjects (aged 18-30 years). Based on the duration of exposure and self-estimated loudness of various leisure-time activities, the weekly and lifetime equivalent noise exposure were calculated. Subjects were categorized in groups with low, intermediate, and high recreational noise exposure based on these values. Hearing was evaluated using audiometry, transient-evoked otoacoustic emissions (TEOAEs), and distortion-product otoacoustic emissions (DPOAEs). Mean differences in hearing between groups with low, intermediate, and high recreational noise exposure were evaluated using one-way analysis of variance (ANOVA). There were no significant differences in hearing thresholds, TEOAE amplitudes, and DPOAE amplitudes between groups with low, intermediate, or high recreational noise exposure. Nevertheless, one-third of our subjects exceeded the weekly equivalent noise exposure for all activities of 75 dBA. Further, the highest equivalent sound pressure levels (SPLs) were calculated for the activities visiting nightclubs or pubs, attending concerts or festivals, and playing in a band or orchestra. Moreover, temporary tinnitus after recreational noise exposure was found in 86% of our subjects. There were no significant differences in hearing between groups with low, intermediate, and high recreational noise exposure. Nevertheless, a long-term assessment of young adults' hearing in relation to recreational noise exposure is needed. Excessive recreational noise exposure in young adults might result in noise-induced hearing loss (NIHL) and tinnitus. Inducing behavioral change in young adults is one of the aims of a hearing conservation program (HCP). The goal of the current study was to evaluate the effect of a hearing education program after 6 months in young adults in relation to knowledge regarding their individual hearing status. The results of a questionnaire regarding the weekly equivalent recreational noise exposure, attitudes and beliefs toward noise, and hearing loss and hearing protector devices (HPDs) were compared between both sessions. Seventy-eight young adults completed the questionnaire concerning recreational noise exposure, youth attitude to noise scale (YANS), and beliefs about hearing protection and hearing loss (BAHPHL). Their hearing status was evaluated based on admittance measures, audiometry, transient-evoked otoacoustic emissions (TEOAEs), and distortion-product otoacoustic emissions (DPOAEs). The main analysis consisted of a mixed model analysis of variance with dependent variables of either the noise exposure or the scores on (subscales of) YANS and BAHPHL. The independent variables were hearing status and session one versus session two. There was a significant decrease in recreational noise exposure and several (sub) scales of YANS and BAHPHL between both the sessions. This behavioral change resulted in a more frequent use of HPDs in 12% of the participants. However, the behavioral change was not completely related to the knowledge of young adults' individual hearing status. To prevent hearing damage in young people, investing in HCPs is necessary, apart from regulating sound levels and its compliance at various leisure-time activities. Also, the long-term effect of HCPs and their most cost-efficient repetition rates should be further investigated. Distortion product otoacoustic emission (DPOAE) level mapping provides a comprehensive picture of cochlear responses over a range of DP frequencies and f2 /f1 ratios. We hypothesized that individuals exposed to high-level sound would show changes detectable by DPOAE mapping, but not apparent on a standard DP-gram. Thirteen normal hearing subjects were studied before and after attending music concerts. Pure-tone audiometry (500-8,000 Hz), DP-grams (0.3-10 kHz) at 1.22 ratio, and DPOAE level maps were collected prior to, as soon as possible after, and the day after the concerts. All maps covered the range of 2,000-6,000 Hz in DP frequency and from 1.3 to -1.3 in ratio using equi-level primary tone stimuli. 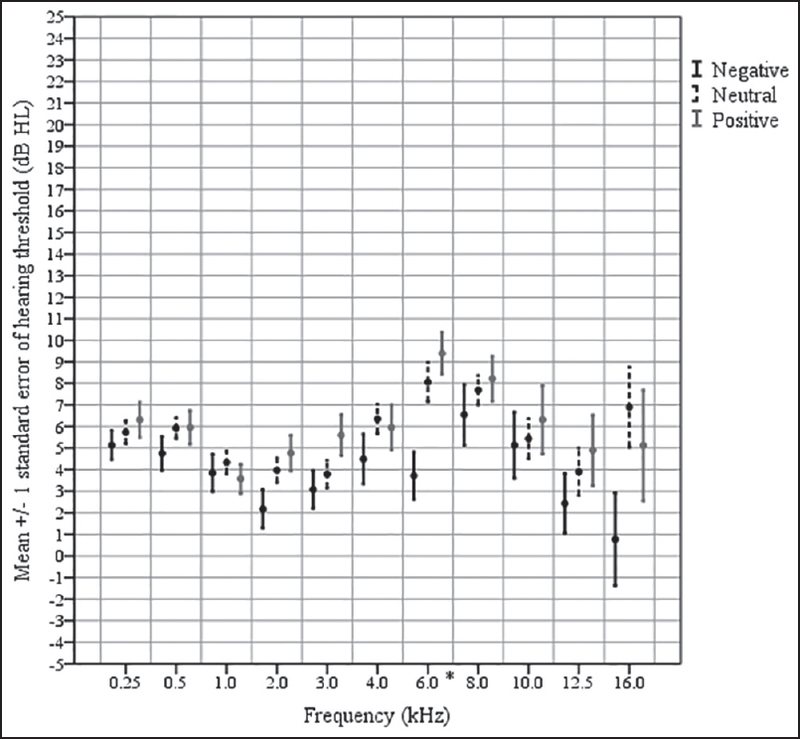 Changes in the pure-tone audiogram were significant (P ≤ 0.01) immediately after the concert at 1,000 Hz, 4,000 Hz, and 6,000 Hz. The DP-gram showed significant differences only at f2 = 4,066 (P = 0.01) and f2 = 4,348 (P = 0.04). The postconcert changes were readily apparent both visually and statistically (P ≤ 0.01) on the mean DP level maps, and remained statistically significantly different from baseline the day after noise exposure although no significant changes from baseline were seen on the DP-gram or audiogram the day after exposure. Although both the DP-gram and audiogram showed recovery by the next day, the average DPOAE level maps remained significantly different from baseline. The mapping data showed changes in the cochlea that were not detected from the DP-gram obtained at a single ratio. DPOAE level mapping provides comprehensive information on subtle cochlear responses, which may offer advantages for studying and tracking noise-induced hearing loss (NIHL). The aim of this cross-sectional study among Swedish hunters was to examine the association between shooting history and presence of high-frequency hearing impairment (HFHI). All hunters registered with an e-mail address in the membership roster of the Swedish Hunters' Association were invited via e-mail to a secure website with a questionnaire and an Internet-based audiometry test. Associations, expressed as prevalence ratio (PR), were multivariately modelled using Poisson regression. The questionnaire was answered by 1771 hunters (age 11-91 years), and 202 of them also completed the audiometry test. 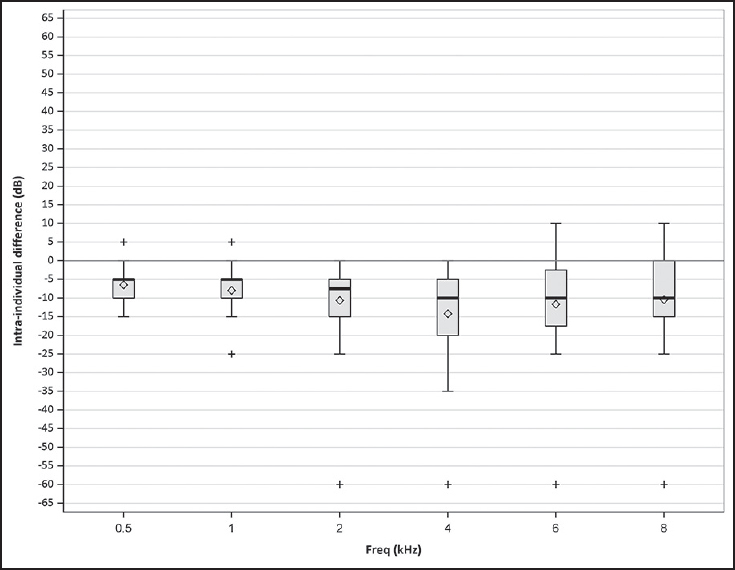 Subjective severe hearing loss was reported by 195/1771 (11%), while 23/202 (11%) exhibited HFHI upon testing with Internet-based audiometry. As many as 328/1771 (19%) had never used hearing protection during hunting. In the preceding 5 years, 785/1771 (45%), had fired >6 unprotected gunshots with hunting rifle calibers. The adjusted PR of HFHI when reporting 1-6 such shots, relative to 0, was 1.5 [95% confidence interval (CI) 1.1-2.1; P = 0.02]. We could not verify any excessive HFHI prevalence among 89 hunters reporting unprotected exposure to such gunshot noise >6 times. Nor did the total number of reported rifle shots seem to matter. These findings support the notion of a wide variation in individual susceptibility to impulse noise; that significant sound energy, corresponding to unprotected noise from hunting rifle calibers, seems to be required; that susceptible individuals may sustain irreversible damage to the inner ear from just one or a few shots; and that use of hearing protection should be encouraged from the first shot with such weapons. High activity noise levels that result in detrimental effects on speech communication have been measured in preschools. To find out if different pedagogical ideologies affect the perceived loudness and levels of noise, a questionnaire study inquiring about the experience of loudness and voice symptoms was carried out in Iceland in eight private preschools, called "Hjalli model", and in six public preschools. Noise levels were also measured in the preschools. Background variables (stress level, age, length of working career, education, smoking, and number of children per teacher) were also analyzed in order to determine how much they contributed toward voice symptoms and the experience of noisiness. Results indicate that pedagogical ideology is a significant factor for predicting noise and its consequences. Teachers in the preschool with tighter pedagogical control of discipline (the "Hjalli model") experienced lower activity noise loudness than teachers in the preschool with a more relaxed control of behavior (public preschool). Lower noise levels were also measured in the "Hjalli model" preschool and fewer "Hjalli model" teachers reported voice symptoms. 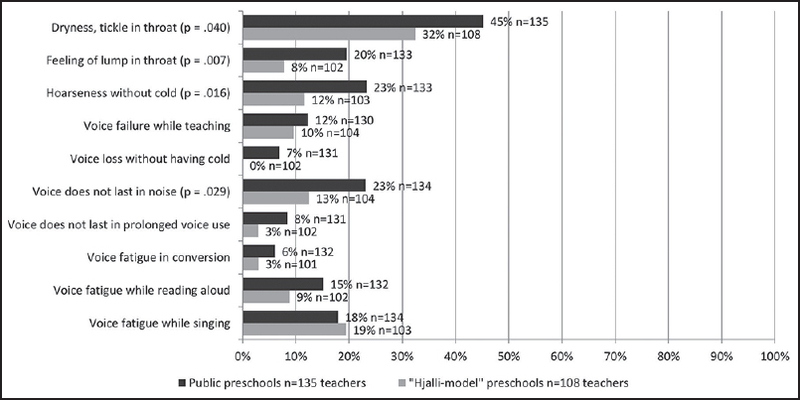 Public preschool teachers experienced more stress than "Hjalli model" teachers and the stress level was, indeed, the background variable that best explained the voice symptoms and the teacher's perception of a noisy environment. Discipline, structure, and organization in the type of activity predicted the activity noise level better than the number of children in the group. Results indicate that pedagogical ideology is a significant factor for predicting self-reported noise and its consequences. Noise exposure in the workplace is a common reality in Québec, Canada as it is elsewhere. However, the extent to which noise acts as a causal or contributive factor in industrial work-related accidents has not been studied thoroughly despite its plausibility. 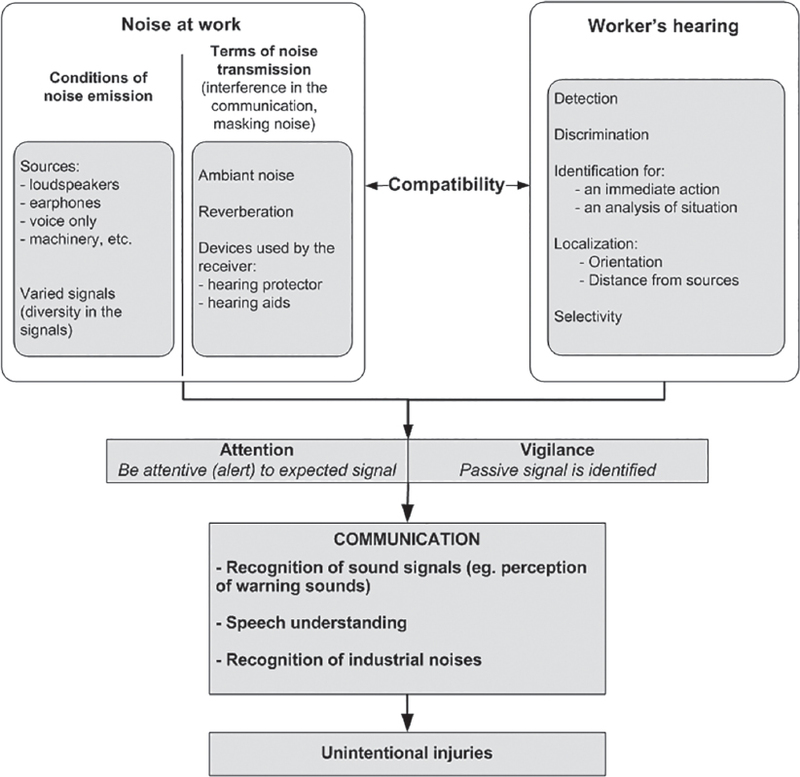 This article aims to describe the importance or potential importance, during investigations looking into the specific causes of each work-related fatal accident, of noise as an explanatory factor. The written information contained in the accident reports pertaining to contextual and technical elements were used. The study used multiple case qualitative content analysis. This descriptive study was based on the content analysis of the 788 reports from the Commission de la santé et de la sécurité du travail du Québec [Workers' Compensation Board (WCB)] investigating the fatal work-related accidents between 1990 and 2005. The study was descriptive (number and percentages). Noise was explicitly stated as one of the explanatory factors for the fatal outcome in 2.2% (17/788) of the fatal accidents, particularly when the work involved vehicular movement or the need to communicate between workers. Noise was not typically considered a unique cause in the accident, notably because the investigators considered that the accident would have probably occurred due to other risk factors (for example, disregard of safety rules, shortcomings in work methods, and inadequate training). Noise is an important risk factor when communication is involved in work. Since noise is ubiquitous and may also interfere with vigilance and other risk factors for accidents, it may be a much more important contributing factor to accidents than is currently recognized. Fishing, one of the oldest productive activities, is an important sector of the Brazilian economy as well as the world economy. 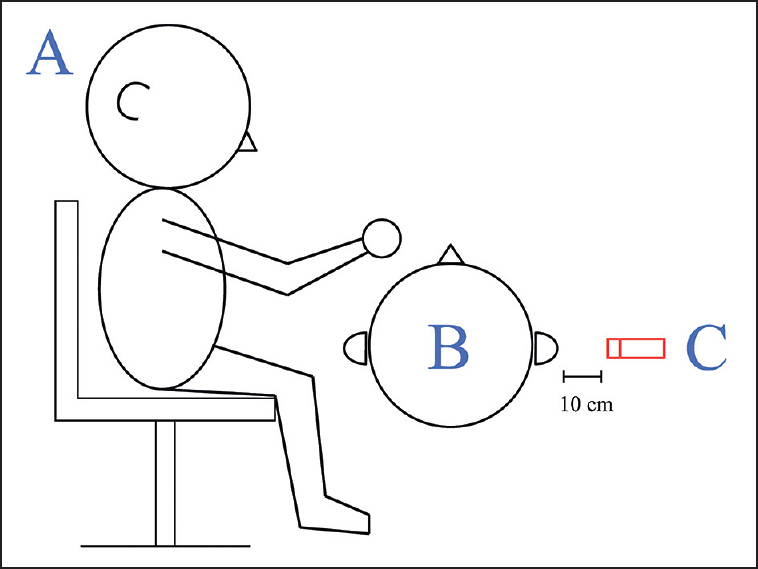 To evaluate the vestibular behavior in population of fishermen. It was realized as a retrospective and cross-sectional study. Thirty fishermen [mean age 49.5 (±8.5) years] whose age ranged from 33 years to 67 years were submitted to anamnesis, otorhinolaryngological evaluation, and vestibular examination through the electronystagmography (ENG). The most evident otoneurological symptoms were: Tinnitus (66.7%), dizziness (63.3%), and hearing loss (53.3%). The most evident clinical symptoms were: Fatigue (36.7%), anxiety (23.3%), and depression (16.7%). There were alterations in the vestibular examination of 13 (43.3%) fishermen in the caloric test. There was a prevalence of alteration in the peripheral vestibular system and there was a major frequency of the peripheral vestibular irritative syndrome (30.0%). Conclusion: The otoneurological complaints were frequent in the population studied that verifies the importance of allowing labyrinth examinations and the need for adopting preventive measures related to noise exposure to carbon monoxide (CO), since they can cause and/enhance various manifestations of labyrinthine vestibular impairment that can affect the quality of life of these workers. Associations between road traffic noise and hypertension have been repeatedly documented, whereas associations with rail or total road, rail, and air (RRA) traffic noise have rarely been investigated. Moreover, most studies of noise in the environment have only taken into account the residential neighborhood. Finally, few studies have taken into account individual/neighborhood confounders in the relationship between noise and hypertension. We performed adjusted multilevel regression analyses using data from the 7,290 participants of the RECORD Study to investigate the associations of outdoor road, rail, air, and RRA traffic noise estimated at the place of residence, at the workplace, and in the neighborhoods around the residence and workplace with systolic blood pressure (SBP), diastolic blood pressure (DBP), and hypertension. Associations were documented between higher outdoor RRA and road traffic noise estimated at the workplace and a higher SBP [+1.36 mm of mercury, 95% confidence interval (CI): +0.12, +2.60 for 65-80 dB(A) vs 30-45 dB(A)] and DBP [+1.07 (95% CI: +0.28, +1.86)], after adjustment for individual/neighborhood confounders. These associations remained after adjustment for risk factors of hypertension. Associations were documented neither with rail traffic noise nor for hypertension. Associations between transportation noise at the workplace and blood pressure (BP) may be attributable to the higher levels of road traffic noise at the workplace than at the residence. To better understand why only noise estimated at the workplace was associated with BP, our future work will combine Global Positioning System (GPS) tracking, assessment of noise levels with sensors, and ambulatory monitoring of BP. Prior research shows that work on board vessels of the Royal Norwegian Navy (RNoN) is associated with noise exposure levels above recommended standards. Further, noise exposure has been found to impair cognitive performance in environmental, occupational, and experimental settings, although prior research in naval and maritime settings is sparse. The aim of this study was to evaluate cognitive performance after exposure to noise among personnel working on board vessels in the RNoN. Altogether 87 Navy personnel (80 men, 7 women; 31 ± 9 years) from 24 RNoN vessels were included. Noise exposure was recorded by personal noise dosimeters at a minimum of 4 h prior to testing, and categorized into 4 groups for the analysis: <72.6 dB(A), 72.6-77.0 dB(A), 77.1-85.2 dB(A), and >85.2 dB(A). The participants performed a visual attention test based on the Posner cue-target paradigm. 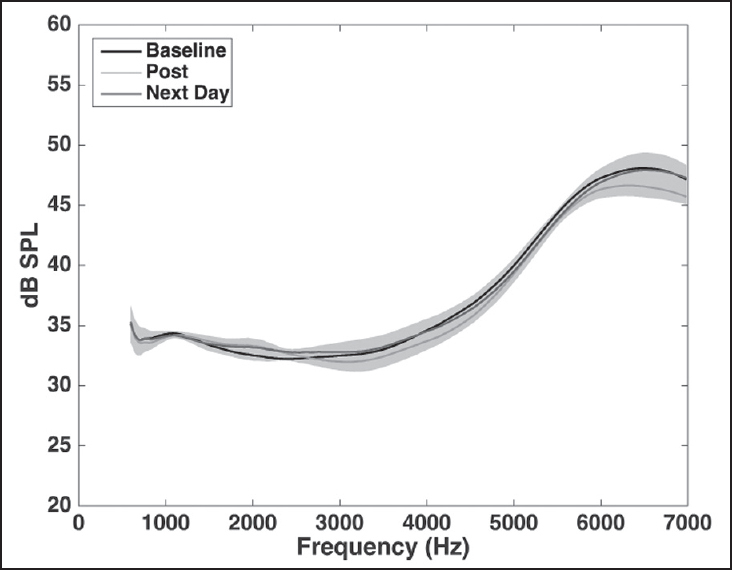 Multivariable general linear model (GLM) analyses were performed to analyze whether noise exposure was associated with response time (RT) when adjusting for the covariates age, alertness, workload, noise exposure in test location, sleep the night before testing, use of hearing protection device (HPD), and percentage of errors. When adjusting for covariates, RT was significantly increased among personnel exposed to >85.2 dB(A) and 77.1-85.2 dB(A) compared to personnel exposed to <72.6 dB(A). The impact of aircraft noise on health is of growing concern. We investigated the relationship between this exposure and mortality from cardiovascular disease, coronary heart disease, myocardial infarction, and stroke. 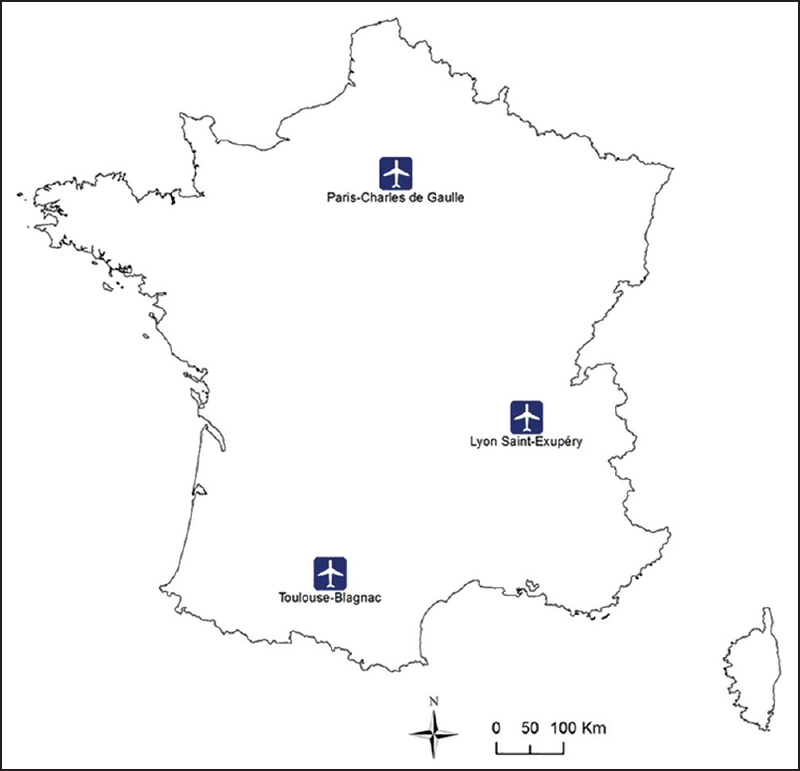 We performed an ecological study on 161 communes (commune being the smallest administrative unit in France) close to the following three major French airports: Paris-Charles de Gaulle, Lyon Saint-Exupéry, and Toulouse-Blagnac. The mortality data were provided by the French Center on Medical Causes of Death for the period 2007-2010. Based on the data provided by the French Civil Aviation Authority, a weighted average exposure to aircraft noise (L den AEI) was computed at the commune level. A Poisson regression model with commune-specific random intercepts, adjusted for potential confounding factors including air pollution, was used to investigate the association between mortality rates and L den AEI. Positive associations were observed between L den AEI and mortality from cardiovascular disease [adjusted mortality rate ratio (MRR) per 10 dB(A) increase in L den AEI = 1.18; 95% confidence interval (CI): 1.11-1.25], coronary heart disease [MRR = 1.24 (1.12-1.36)], and myocardial infarction [MRR = 1.28 (1.11-1.46]. Stroke mortality was more weakly associated with L den AEI [MRR = 1.08 (0.97-1.21]. These significant associations were not attenuated after the adjustment for air pollution. The present ecological study supports the hypothesis of an association between aircraft noise exposure and mortality from cardiovascular disease, coronary heart disease, and myocardial infarction. However, the potential for ecological bias and the possibility that this association could be due to residual confounding cannot be excluded. During dental treatments, patients may experience negative emotions associated with the procedure. This study was conducted with the aim of using functional magnetic resonance imaging (fMRI) to visualize cerebral cortical stimulation among dental patients in response to auditory stimuli produced by ultrasonic scaling and power suction equipment. 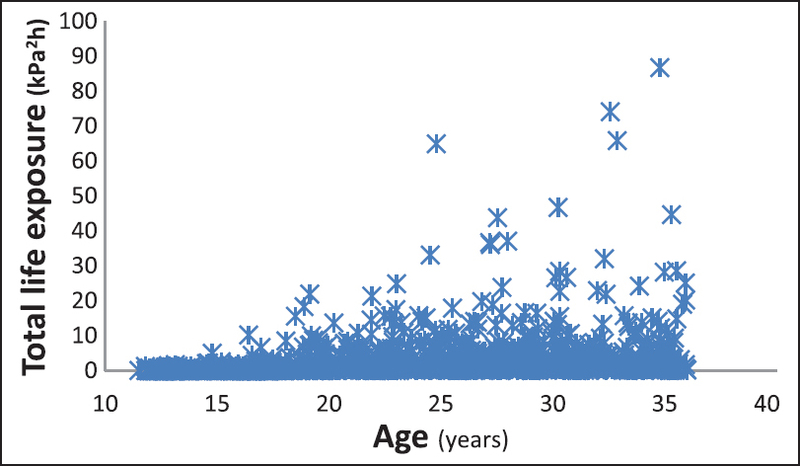 Subjects (n = 7) aged 23-35 years were recruited for this study. All were right-handed and underwent clinical pure-tone audiometry testing to reveal a normal hearing threshold below 20 dB hearing level (HL). As part of the study, subjects initially underwent a dental calculus removal treatment. During the treatment, subjects were exposed to ultrasonic auditory stimuli originating from the scaling handpiece and salivary suction instruments. After dental treatment, subjects were imaged with fMRI while being exposed to recordings of the noise from the same dental instrument so that cerebral cortical stimulation in response to aversive auditory stimulation could be observed. The independent sample confirmatory t-test was used. Subjects also showed stimulation in the amygdala and prefrontal cortex, indicating that the ultrasonic auditory stimuli elicited an unpleasant response in the subjects. Patients experienced unpleasant sensations caused by contact stimuli in the treatment procedure. In addition, this study has demonstrated that aversive auditory stimuli such as sounds from the ultrasonic scaling handpiece also cause aversive emotions. This study was indicated by observed stimulation of the auditory cortex as well as the amygdala, indicating that noise from the ultrasonic scaling handpiece was perceived as an aversive auditory stimulus by the subjects. Subjects can experience unpleasant sensations caused by the sounds from the ultrasonic scaling handpiece based on their auditory stimuli. The purpose of our study was to identify the main factors associated with objective noise-induced hearing loss (NIHL), as indicated by abnormal audiometric testing, in Spanish workers exposed to occupational noise in the construction industry. We carried out a prospective study in Tenerife, Spain, using 150 employees exposed to occupational noise and 150 age-matched controls who were not working in noisy environments. The variables analyzed included sociodemographic data, noise-related factors, types of hearing protection, self-report hearing loss, and auditory-related symptoms (e.g., tinnitus, vertigo). 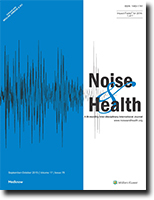 Workers with pathological audiograms had significantly longer noise-exposure duration (16.2 ± 11.4 years) relative to those with normal audiograms (10.2 ± 7.0 years; t = 3.99, P < 0.001). The vast majority of those who never used hearing protection measures had audiometric abnormalities (94.1%). Additionally, workers using at least one of the protection devices (earplugs or earmuffs) had significantly more audiometric abnormalities than those using both protection measures simultaneously (Chi square = 16.07; P < 0.001). The logistic regression analysis indicates that the use of hearing protection measures [odds ratio (OR) = 12.30, confidence interval (CI) = 4.36-13.81, P < 0.001], and noise-exposure duration (OR = 1.35, CI = 1.08-1.99, P = 0.040) are significant predictors of NIHL. This regression model correctly predicted 78.2% of individuals with pathological audiograms. 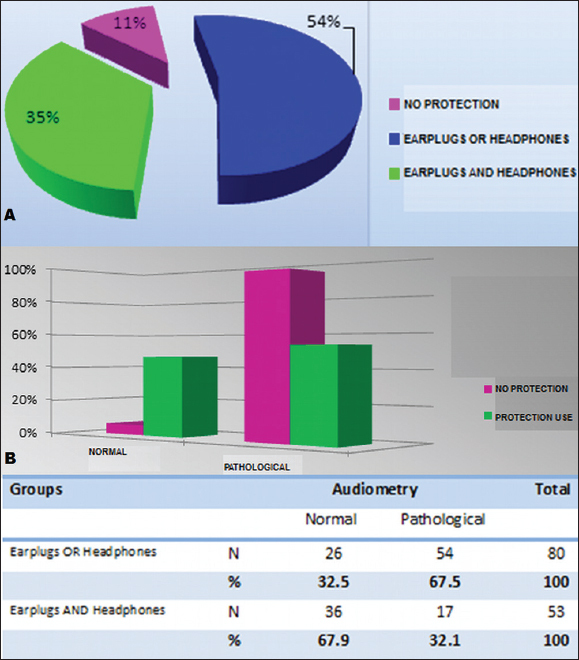 The combined use of hearing protection measures, in particular earplugs and earmuffs, associates with a lower rate of audiometric abnormalities in subjects with high occupational noise exposure. The use of hearing protection measures at work and noise-exposure duration are best predictive factors of NIHL. 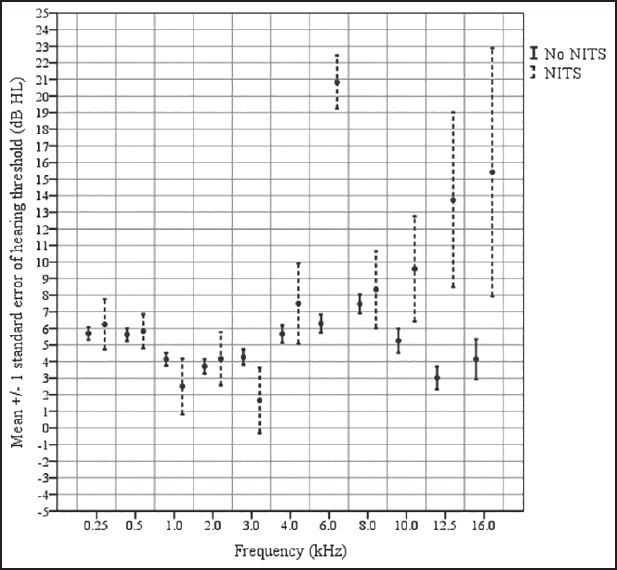 Auditory-related symptoms and self-report hearing loss do not represent good indicators of objective NIHL. Routine monitoring of noise levels and hearing status are of great importance as part of effective hearing conservation programs. This paper reports on the examination of the relationship between self-reported historical noise exposure during leisure activities and audiological indicators: Measured hearing threshold levels (HTLs) and otoacoustic emissions (OAEs). The research was conducted by a cross-sectional survey of 1,432 individuals whose ages ranged from 11 years to 35 years. Methodology included a comprehensive audiometric assessment including otoscopy, pure tone audiometry (PTA) (air- and bone-conduction), OAEs, and tympanometry. A comprehensive questionnaire gathered information on demographics, hearing health status, and participation in work, nonwork, and leisure activities. Using the history of work, nonwork, and leisure noise exposure, a cumulative lifetime noise exposure was estimated. No correlation was found between cumulative lifetime noise exposure and audiometric PTA or OAE parameters. Impulse peak insertion loss (IPIL) was studied with two acoustic test fixtures and four hearing protector conditions at the E-A-RCAL Laboratory. IPIL is the difference between the maximum estimated pressure for the open-ear condition and the maximum pressure measured when a hearing protector is placed on an acoustic test fixture (ATF). Two models of an ATF manufactured by the French-German Research Institute of Saint-Louis (ISL) were evaluated with high-level acoustic impulses created by an acoustic shock tube at levels of 134 decibels (dB), 150 dB, and 168 dB. The fixtures were identical except that the E-A-RCAL ISL fixture had ear canals that were 3 mm longer than the National Institute for Occupational Safety and Health (NIOSH) ISL fixture. Four hearing protection conditions were tested: Combat Arms earplug with the valve open, ETYPlugs ® earplug, TacticalPro headset, and a dual-protector ETYPlugs earplug with TacticalPro earmuff. The IPILs measured for the E-A-RCAL fixture were 1.4 dB greater than the National Institute for Occupational Safety and Health (NIOSH) ISL ATF. For the E-A-RCAL ISL ATF, the left ear IPIL was 2.0 dB greater than the right ear IPIL. For the NIOSH ATF, the right ear IPIL was 0.3 dB greater than the left ear IPIL. Recent findings show the importance of acceptance in the treatment of chronic tinnitus. So far, very limited research investigating the different levels of tinnitus acceptance has been conducted. The aim of this study was to investigate the quality of life (QoL) and psychological distress in patients with chronic tinnitus who reported different levels of tinnitus acceptance. The sample consisted of outpatients taking part in a tinnitus coping group (n = 97). Correlations between tinnitus acceptance, psychological distress, and QoL were calculated. 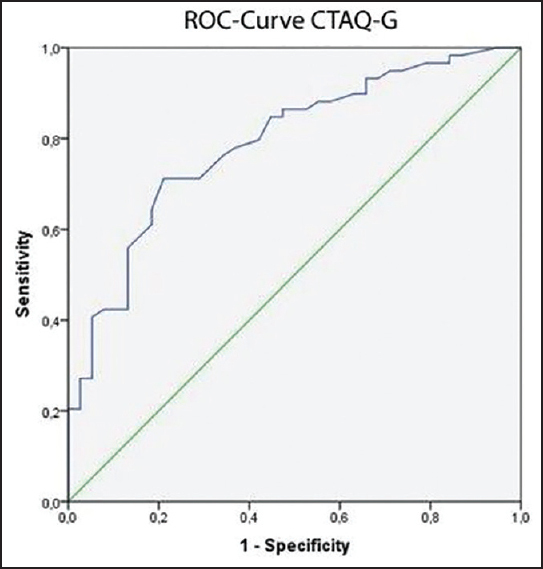 Receiver operating characteristic (ROC) curves were used to calculate a cutoff score for the German "Tinnitus Acceptance Questionnaire" (CTAQ-G) and to evaluate the screening abilities of the CTAQ-G. 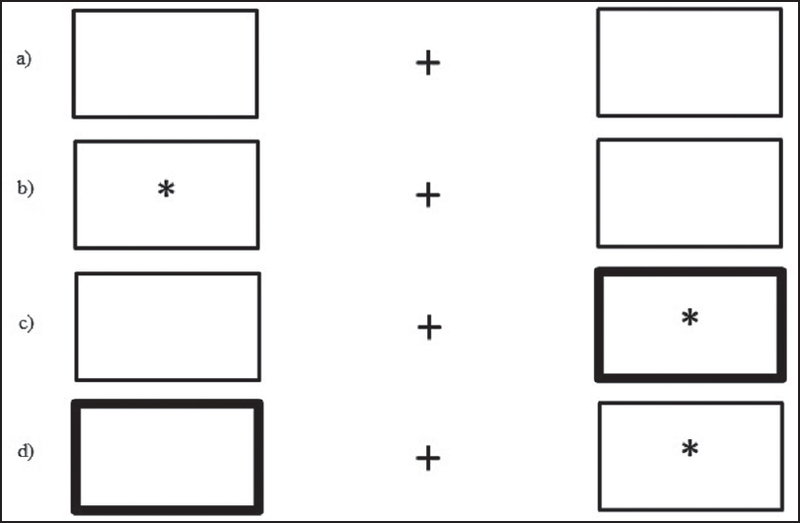 Independent sample t-tests were conducted to compare QoL and psychological distress in patients with low tinnitus acceptance and high tinnitus acceptance. A cutoff point for CTAQ-G of 62.5 was defined, differentiating between patients with "low-to-mild tinnitus acceptance" and "moderate-to-high tinnitus acceptance." Patients with higher levels of tinnitus acceptance reported a significantly higher QoL and lower psychological distress. Tinnitus acceptance plays an important role for patients with chronic tinnitus. Increased levels of acceptance are related to better QoL and less psychological distress.